Pulmonaria belongs to the family Boragináceae. This family is derived from the plant community of Borágo, an old Latin name of unknown provenance. 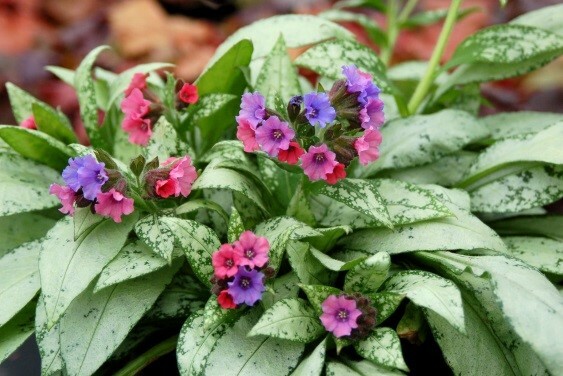 The name Pulmonaria has been derived from the Latin name pulmo (pulmonis) which means: lung. 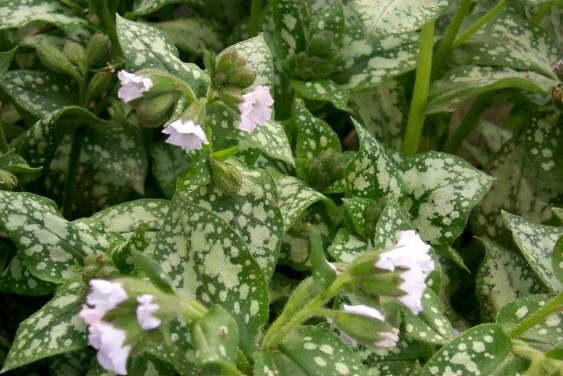 In the middle-ages, herbalists believed that the spots on the leaves of Pulmonaria had borne a resemblance to lung disease, as described in The Doctrine of Signatures. 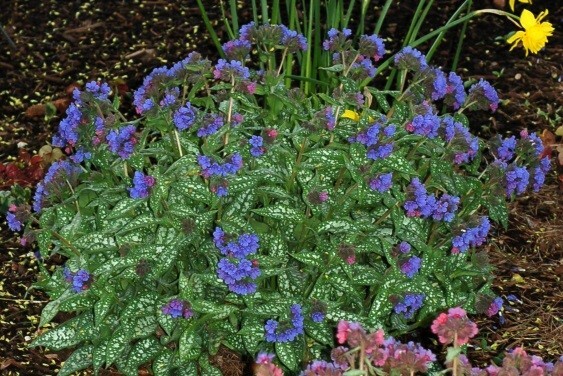 This book theorized that Pulmonaria is a medicinal herb, and was a remedy against lung disease or had a beneficial effect on the lungs and would cure that particular part of the body. 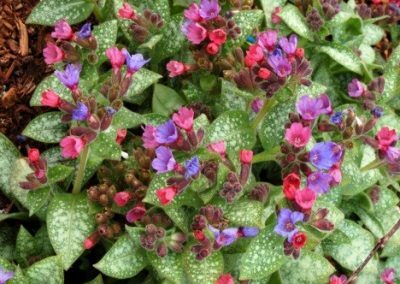 Pulmonaria consists of about 12 commonly grown species of hairy herbaceous to evergreen perennials widely spread from Europe to the Caucasuses and Russia. 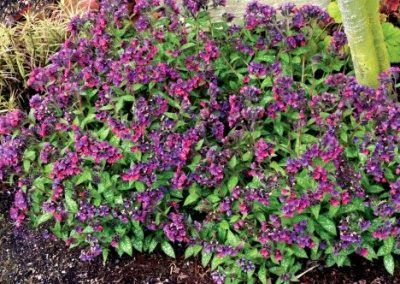 In general, Pulmonaria like moist soil, but the new varieties do very well in average garden soil and are drought tolerant. 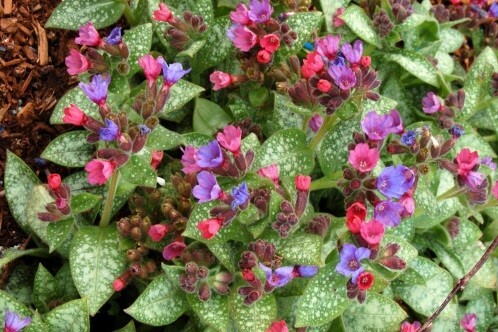 Pulmonaria are perennials that grow from a basal rosette. The leaves are large, typically silver-spotted, and low growing, with hairy tops and undersides. 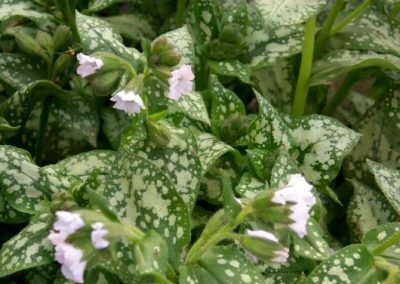 Most of the Pulmonaria keep their leaves in winter and become deciduous slightly in spring, just before the regrowth begins. The coarseness of the leaves is helpful, as it is distasteful to deer in summer. 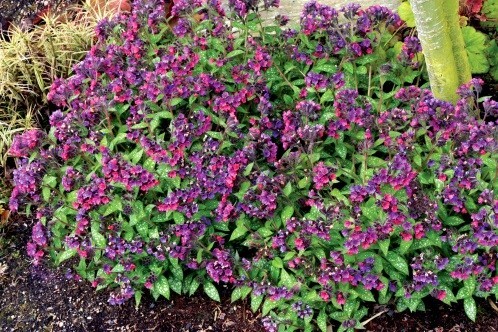 These new Pulmonaria, introduced by Terra Nova® Nurseries are far more heat and humidity tolerant. 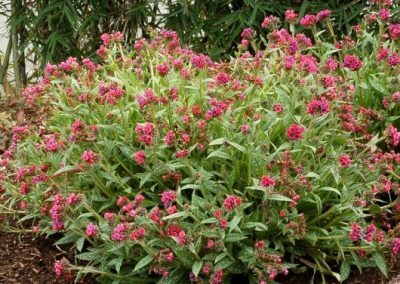 Vigorous, mildew-free leaves, topped by strongly colored flowers in corals, reds and blues enhance the early spring value. 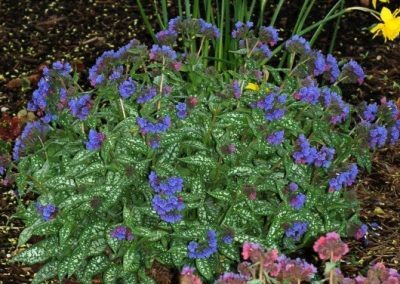 Today’s consumers love the fact that Pulmonaria are excellent early hummingbird food plants and they feed foraging honey bees early in the season. Pulmonaria ‘Bubble Gum’® features delicate clusters of pink bell-shaped flowers with hot, true pink eyes at the ends of the stems from mid to late spring. These emerge from distinctive purple flower buds. Its attractive glossy narrow leaves remain light green in colour with showy silver variegation throughout the season. 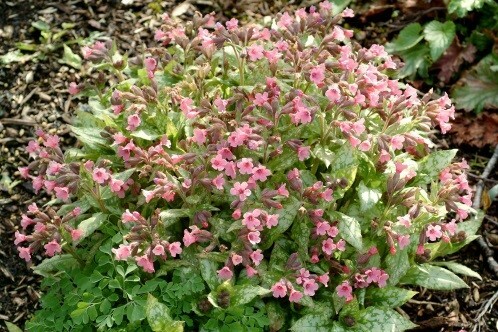 Pulmonaria ‘Bubble Gum’® is an herbaceous, ultra-hardy perennial with a mounded form. It carries US patent 14086 and EU patent 16876. Pulmonaria ‘Dark Vader’® is a hybrid which is noted for its combination of dark, thick, long-petioled, oval to lance-shaped leaves with large, silver spots and compact habit. Drooping clusters of funnel-shaped, blue, purple, and pink flowers bloom on short stalks just above the foliage in spring. This is a fine, mildew-resistant plant with a strong habit. 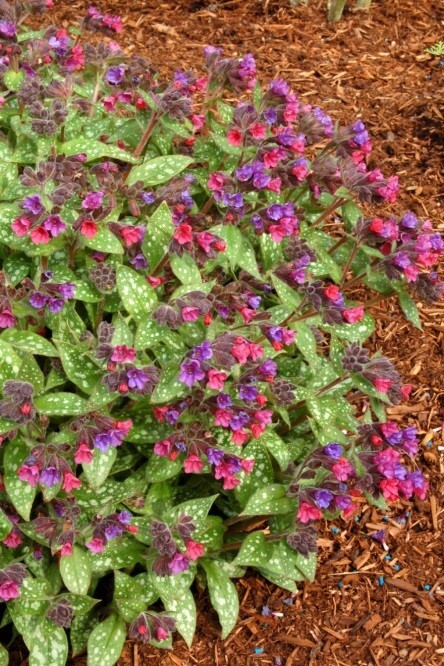 Pulmonaria ‘Dark Vader’® is a relatively low maintenance perennial. It carries US patent PP12333 and EU patent 14325. 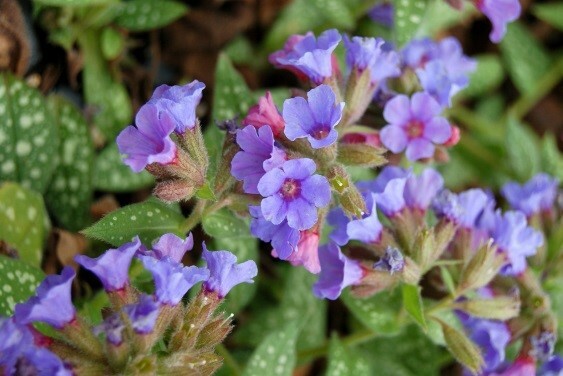 Pulmonaria ‘Moonshine’® is a real star among Pulmonaria. It is the flashiest one with great garden vigor, compact growth habit and mildew resistance. The shimmering silver leaves feature neat dark green edges on, and then become prettily speckled with green by flowering time. Plants make dense clumps with dainty, ice-blue flowers. It carries US patent PP13686 and EU patent 14325. 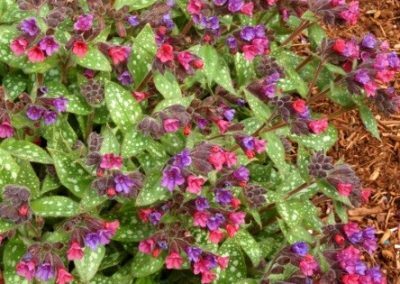 Pulmonaria ‘Raspberry Splash’® is a mounding variety that features very upright, strongly silver-blotched, sharply pointed foliage and bright, raspberry-coral flowers. It is a sun-tolerant variety and carries US patent PP12138 and EU patent 11545. 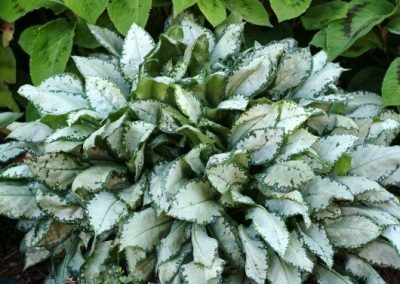 Pulmonaria ‘Silver Bouquet’® forms a large clump of long, pointed, shiny silver leaves, with the occasional fleck of green, topped by clusters of large pink bells that change to bright blue as they mature. A charming spectacle when both flower colours appear on the same plant at the same time. 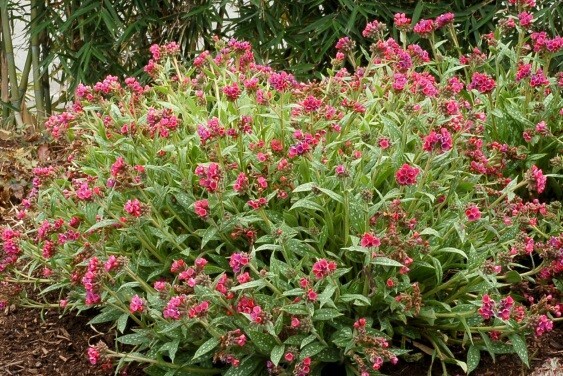 It has impressive vigor and is heat and humidity-tolerant. Excellent, mildew-resistant border plant, suitable for mass plantings. Pulmonaria ‘Silver Bouquet’® carries US patent PP20059 and EU patent 24135. 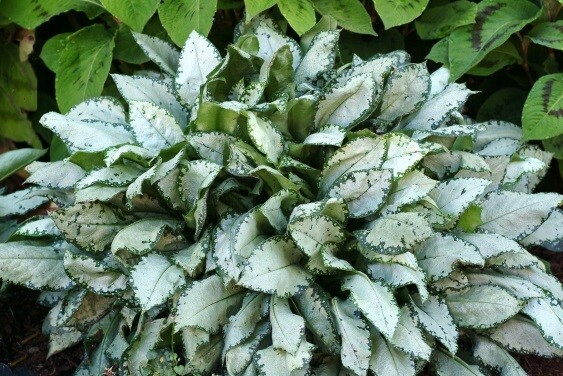 Pulmonaria ‘Trevi Fountain’® has an upright mound of superb, brightly, silver-spotted, eye-pleasing foliage. It will give rise to profusion of cobalt-blue flowers in spring. A real stunner with great vigor. It carries US patent PP13047. Patent applied for in Europe. Pulmonaria ‘Victorian Brooch’® is one of the longest blooming of all Pulmonaria with masses of outfacing magenta-coral flowers that pop against the attractive, long, silver-spotted foliage. It is mildew-resistant. Pulmonaria ‘Victorian Brooch’® carries US plant patent PP11234 and EU patent 9811. 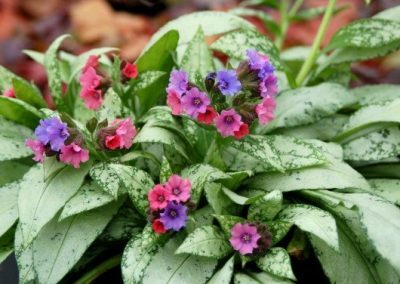 Pulmonaria is not an old fashioned plant any more. Pulmonaria are becoming more and more popular recently. Garden designers are aware of the extra value of Pulmonaria in the garden and are useful in areas where deer are a problem. It is nearly the earliest blooming perennial in the garden giving bees and birds their first sip of nectar. The leaf colors show much diversity with an assortment of silver splashes over differing green backgrounds. Pulmonaria combine wonderfully with Corydalis and Dicentra.